Joint care is a complex and controversial subject. New research conclusively suggests that environment plays a significant role in joint health in addition to heredity. To what degree the causality is hereditary and what proportion is environmental is where the controversy lies. We at Cedar Creek believe joint quality is complex and is a combination of both of these variables. 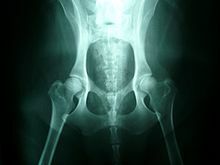 We take the hereditary variable into account by screening the hips and elbows of each of our dogs before they are entered into our breeding program. In addition, we research the joint quality of dogs in the pedigree. This greatly reduces the likelihood of joint issues in our puppies. The remainder of this page is dedicated to the environmental variable. You will find pragmatic suggestions for what you can do as a dog owner to provide the best opportunity for healthy joints. 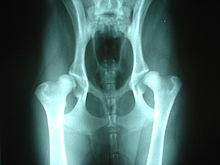 Growing puppies require intentional attention to growing healthy joints. Feed a premium large breed puppy kibble formulated specifically for large breed puppies. A premium large breed puppy kibble should be formulated to avoid excessive calcium. 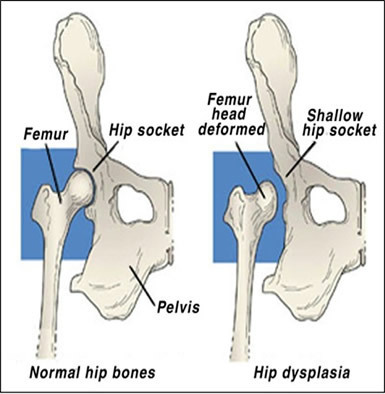 Rapid growth can cause skeletal disorders (like hip dysplasia). Feed your puppy the daily recommended amounts suggested by your vet or provided by the manufacturer of the puppy kibble. The calories your puppy consumes between 3-10 months of age has been shown to have a significant impact on joint health. Switch to a premium adult dog food kibble at 6 months of age. Keep your puppy at the optimal weight. Obesity can accelerate the degeneration of joints. Ideal Body Condition Scoring (BCS) is 5/9. Click here for an explanation of BCS. Finding and maintaining your dog's ideal weight can significantly extend your dog's life too. A recent 14 year study found that dogs fed to ideal body condition lived on average 1.8 years longer than their overweight litter mates. That's an extra 2 years of life and love, just for keeping your dog close to his or her ideal body weight!!! Help your puppy maintain good muscle mass through exercise. Avoid activities where your puppy is on slippery surfaces. Avoid activities where your puppy jumps, stops or changes directions abruptly. Avoid rough housing with other dogs. Don't take your puppy jogging (or any other repetitive motion) until he is at least 18 months of age. Feed your dog the daily recommended amounts suggested by your vet or provided by the manufacturer of the dog kibble. Do not free feed your dog. Avoid activities that require your dog to jump, such as unloading from a vehicle. Feed a premium adult dog kibble. Maintain good muscle mass through exercise.